The screenshot below was taken today, when for the first time after I keyed in 'Puteri' on Google search this blog appeared at the top of the search results! Two other blogs of mine appeared fifth and seventh on the list. Woohooo! And the screenshot below was taken last November. 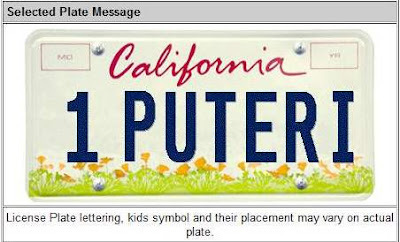 Remember I talked about a custom plate for my car? It has been ordered and we have not heard anything back from the DMV. It has been over a month. :-( The final decision was this one. Puteri, congratulations! I just discovered my PR went from 0 to 2!! Thanks to you. Thanks, Hooi Imm, and yes I did notice yours went up from 0 to 2 too! Woohooo! Heheh. A lot more opportunities have opened with PPP, right! Double that Woohoo, Puteri! My blog came up first when I keyed in my name and blogname That's cool! I wonder how long it will stay that way. Haha! I guess it is worth taking time to come up with special names. I like the plate you ordered. Time to call DMV for status. No? Woohoo, Rita!! Imagine there are other Rita Hos out there and your blog came out tops! Cool, indeed! Take a screenshot of that search result, Rita, and post it in your blog! Sure your blog will stay on top if traffic is steady. As for my name, I have other blogs that have links to some current stories and when people make searches regarding the stories my blogs come up among the search results ... so that helps with the Puteri brand name! That Feedjit widget I installed in all my blogs really help me see who the visitors to my blogs are, and how they got there. Really useful! You are right, we should check back with DMV. We paid for the registration online by credit card and we saw that charge in our bill. Who knows there's a back log with custom plates and that is why it is taking so much time! Hehe. Yes, you told me about your new PR! Woohoo! Eh, you noticed or not how many of the opps that are available to you now excluded blogspot? Imagine if you had not gotten your own domain name?! Ya lor, more limited opps! Good job we got our own domain name, eh! Woohooo! I'm curious how you see other ppl PR??..oh!! If I don't active in my blog,will my PR go down? ?..Thank you cikgu first for my question. hahaha!!. Congrats dear. Stay happy with that. I love that license plate! Woo..makes driving even more fun isns't it, knowing the car is more personalised. Show us the pix of plate once done okay! Take care sweetie. Yes, the plate looks good, but the car I am driving is not stylish enough! I have a mini van, a mommy mobile! Haha.